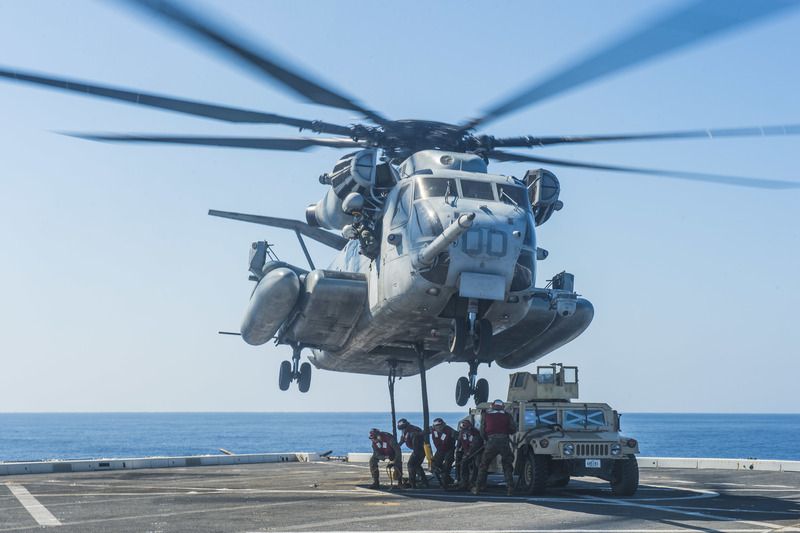 Marines assigned to 3rd Battalion, 3rd Marine Regiment attach a Humvee to a CH-53E Super Stallion helicopter on the flight deck of amphibious transport dock USS Green Bay (LPD-20) on Oct. 31 during Blue Chromite. US Navy photo. 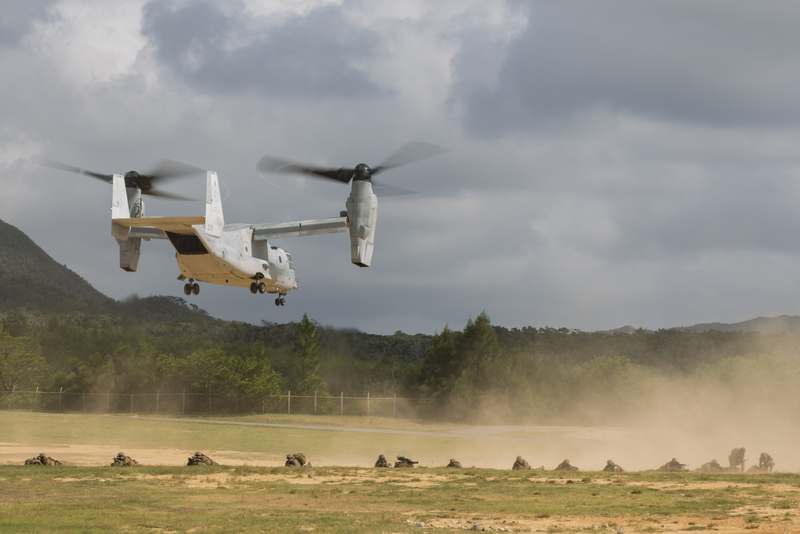 Amphibious forces in the Pacific practiced a “back to the future” tactic of seizing advance naval bases and conducting maneuver warfare during exercise Blue Chromite in Okinawa, Japan, exercise leaders told USNI News. The exercise, which started on Oct. 29 and ended today, used 3rd Marine Division Marines to practice the type of operations – maneuver warfare in an anti-access/area-denial environment against a sophisticated adversary – that are outlined in the new Marine Corps Operating Concept. “As recent as five, ten years ago the large bases that we have throughout the Pacific were very secure, very safe, and we were able to conduct operations moving from those large bases and then return to them,” 3rd Marine Division Commanding General Maj. Gen. Richard Simcock told USNI News on Nov. 1. U.S. Marines assigned to 3rd Battalion, 3rd Marine Regiment provide security as an MV-22B Osprey tiltrotor aircraft flies overhead during an air assault drill as part of Blue Chromite on Nov. 1, 2016. US Marine Corps photo. The exercise centered around a series of raid scenarios that required Marines to move rapidly from ship to shore and from objective to objective on land without ever setting up a heavy footprint that would bog down their movements. They moved people, ground vehicles, weapons and supplies via traditional aircraft and surface connectors as well as on combat rubber raiding crafts and Army Runnymede-class large landing craft. During these operations, the Marines didn’t have an established forward operating base to work from. Instead, ground and aviation elements stayed co-located in the field, keeping the entire Marine Air-Ground Task Force together to allow quick successive movements to support the missions. In fact, the aviation element one night camouflaged and stored MV-22B Ospreys and CH-53E Super Stallion heavy-lift helicopters in the middle of a field overnight to test out the expeditionary advance base operations included in the Marine Corps Operating Concept. “Blue Chromite is taking a concept that we’re working with, the concept of expeditionary advance base operations, and looking for ways to penetrate the enemy’s strategy of anti-access/area-denial,” Simcock said. An MV-22B Osprey tiltrotor aircraft and a UH-1Y Venom helicopter are camouflaged to prevent detection from above during Blue Chromite on Oct. 31, 2016. 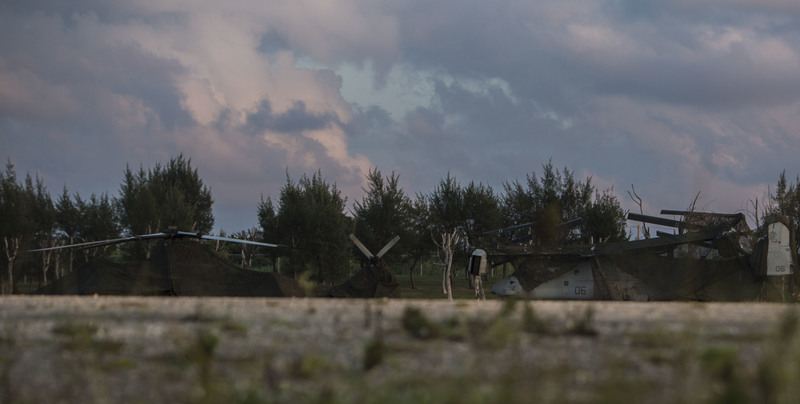 Camouflaging the aircraft overnight is one of the methods used by forward deployed Marines to remain agile with a reduced signature. US Marine Corps photo. For example, Simcock said, compared to operations in World War II the Marines now have the challenge of hiding their location from an enemy both physically and electronically, but they also have more ways to attack the enemy physically and within the electromagnetic spectrum today. The Navy’s blue water force has already had to adapt to this environment and is looking for ways to integrate this capability to maneuver in an anti-access/area-denial environment with its ability to push Marines ashore, Rear Adm. Marc Dalton, Commander of Expeditionary Strike Group 7, said in the same interview. Blue Chromite only simulated the use of other naval forces – the only live assets were amphibious transport dock USS Green Bay (LPD-20), expeditionary fast transport USNS Fall River (T-EPF-4), and the Army’s USAV Harpers Ferry (LCU-2022) – but Dalton said the Navy is focused on learning how to integrate a range of naval forces in support of amphibious operations, and in particular the fast-paced maneuver warfare. “Where (the Marines’ expeditionary advance base operations) differs for the Navy is in what capabilities do we need to bring to bear to support the Marines based on that mission,” the admiral said of the difference between supporting Marines in this exercise compared to other amphibious exercises. 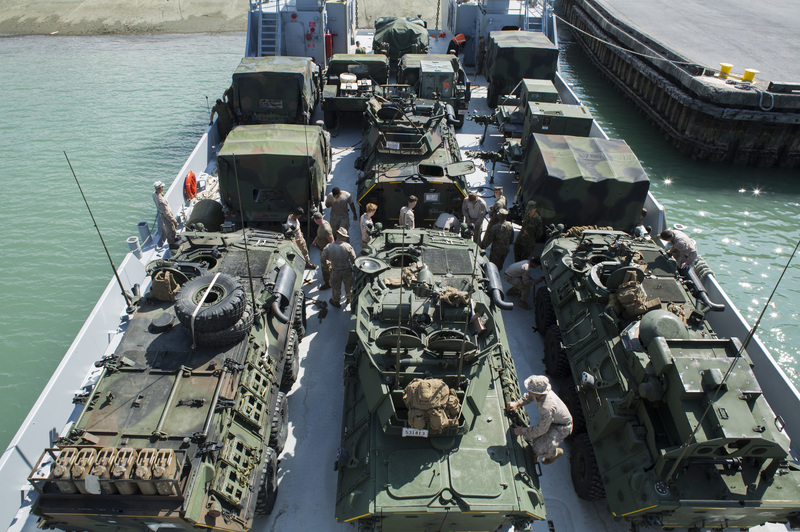 U.S. service members load Humvees onto the USAV Harpers Ferry, Runnymede-class large landing craft, at Naha Port, Okinawa, Japan, during Blue Chromite on Oct. 31, 2016. US Marine Corps photo. Dalton said the Navy has successfully integrated the V-22 into those plans and is now turning its focus to the F-35 Joint Strike Fighter, which the Marines will be sending to Japan in January. The concept of expeditionary advance base operations will not go away, Simcock made clear. Even as the Navy works to better understand how it can use various classes of ship to support the Marines going ashore, Simcock said exercises in the Pacific would continue to bring in more joint and coalition forces to support the expeditionary advance base concept.